« Second verse, same as the first. My butler/good friend Mike Woycheck is a Tom Cruise fan and a Katie Holmes fan, so when he texted me yesterday that he happened to walk past Tom Cruise and Katie Holmes with their daughter at a farm in the North Hills, I was enthusiastic in encouraging him to say hello to them. I mean, first of all, that’s a once in a lifetime chance to meet the biggest movie star on the planet, and second of all, he’s the biggest movie star on the planet; if he was in a bad mood and didn’t want to be bothered by fans, he wouldn’t go out and about so blatantly. They were very gracious – took the time to talk, shake hands, and say hello. They were appreciative of the hospitality (thanking Pittsburgh) and said they were having a great time. And Suri is adorable. Totally were a family having a nice Sunday afternoon. So, there you have it! The Tom Cruises are in town (The New Hollywood) and they are actually enjoying the city instead of hiding and they are adorable and my butler has earned a bazillion infinity cool points. I hope they’re transferable because I could use a few hundred thousand. I HAVE A DEBBIE GIBSON PANDORA STATION FOR THE LOVE OF GOD. I have the need; the need for PUMPKINS! 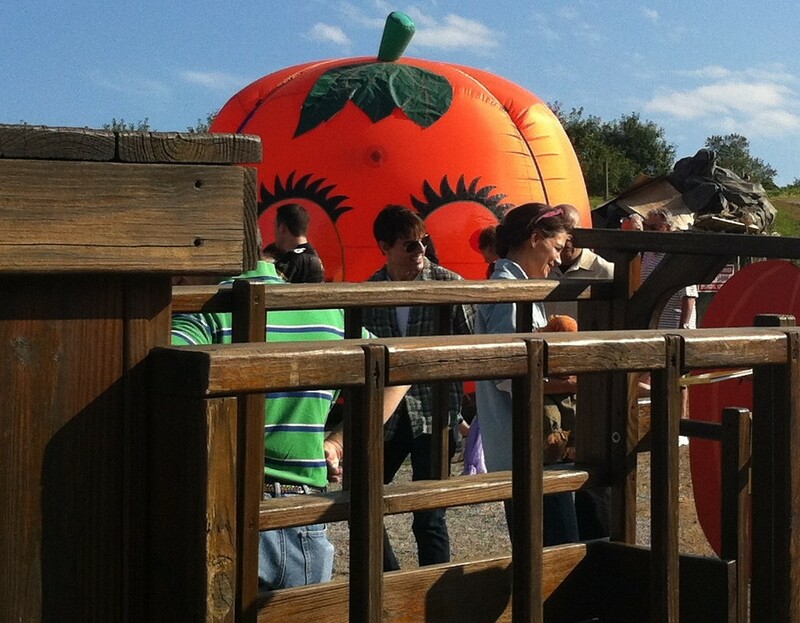 Sorry, I know it’s “I feel the need…” Now SHOW ME THE PUMPKINS! Tom: Mr. Soergel, did you order the Hot Apple Cider? Mrs. Soergel: You *don’t* have to answer that question! Mr. Soergel: I’ll answer the question! You want answers? Tom: I think I’m entitled to. Mr. Soergel: You want answers? Tom: I want the pumpkins! Mr. Soergel: You can’t handle the pumpkins! If we saw ANYONE famous, ever, in public, I would send in my husband. That man can (and will) talk casually to anybody. Unless it is one of the DIY guys in our local home improvement store. Then I would have to execute a full body tackle and drag them to my house. We need some remodeling. Everywhere. I see that Tom is still wearing those Top Gun sunglasses. If I starred in Top Gun, I’d take those sunglasses to the grave with me too. I honestly think that Pittsburgh is a great place for filming simply because most of us won’t go out of our way to hunt them down. @KathyB, actually I think it should be “Pittsburgh is awesome.” You know they couldn’t do this in LA or NY. They’d be mobbed. But here they get to be an ordinary family doing ordinary family stuff while schmoozing us local joes in a low-key way. That must be a relief for them. …..and, everyone else thought he was nuts. and, introducing, suri cruise as snoopy. Just heard Mike Harvey on WTAE try to make a joke about Tom’s height. As a short person and married to one who is the same height, I didn’t dig it and changed the chanel to KDKA. Wendy called him on it. Dave T is he really shorter than a pumpkin, come on get real. Do you feel like a bigger person now…no I don’t think so. Tom will never be short where it counts: Short of cash. And yeah, I hope the rest of the Burghers have the good sense to leave these people alone, or at least just to wave and say “Hello! Thanks for coming here and leaving wads of studio cash behind!” when they’re out and about. Envision the Cruises going back to H’wood and telling their movie-type friends they just spent a month in Pittsburgh. And the Cruises being all, “Hey now! It’s a really nice place, the people were very cool to us, we took Suri to a pumpkin farm and we had a great day and nobody bothered us except some guy who called himself Ginny’s Butler” etc. etc. Word of mouth is strong advertising, people. I think its cool that they can come out and do things as a family without being hounded. I hope they enjoy themselves and can “relax” while theyre here. And really? The entire height thing is so old. Move along. @bucdaddy…I constantly have to defend pittsburgh as a city that actually does stuff other than steel and has the occasional blue sky. apparently, the “most liveable city” thing ain’t doing the trick. Thumbs up for another movie being made in Pittsburgh.